Sim Tze Tzin is the strategy director for Malaysia’s opposition party Parti Keadilan Rakyat (PKR) – one of the three parties that comprise the country’s opposition alliance known as Pakatan Rakyat (PR) – and a member of parliament. After the imprisonment of PKR’s head and opposition leader Anwar Ibrahim, The Diplomat’s Prashanth Parameswaran sat down with Sim in Washington, D.C. to discuss his thoughts on the future of Malaysia’s opposition and the country’s trajectory. The Malaysian government continues to insist that the recent Anwar verdict was an outcome decided by an independent judiciary and subject to exhaustive due process over many years. What is your response to this? In the entire history of Malaysia there are only seven cases of this kind which have gone to court, and two of them have involved Anwar. 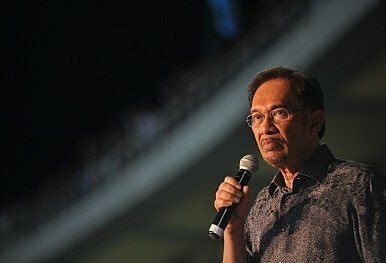 We feel that it is a political conspiracy to stop Anwar’s rise to power. Anwar is the person who won 52 percent of the popular vote in 2013. He is the single biggest threat to the current government. The government wants to tarnish his name; to destroy his reputation. Putting him in jail removes him from political life for the next ten years. That is their motive: stopping his rise to challenge the government. Reports have surfaced over the past week that Anwar’s family is seeking a royal pardon on his behalf. What is your reaction to this and what do you think the prospects are? Personally I think prospects for a royal pardon are bleak. The Federal Territories Pardon Board consists of the Attorney General, which brought Anwar’s case to the court, the Federal Territories Minister [Tengku Adnan Mansor] and other senior government officials under the federal government. The board will review the case and bring it to the king who is the head of state, who will then have to act according to the advice of this board. So in that sense, the prospects are quite bleak. This royal pardon is brought by Anwar’s family, and it is because of love: love for a father, love for a husband. It is something that I feel very sad about. His family feels his health is deteriorating after three weeks in the jail, and he may need an operation. So hopefully the board and the king will consider the pardon based on health rather than an admission of guilt. Anwar has refused to seek a royal pardon because it would constitute an admission of guilt. But his is brought by his family, not Anwar himself. How has Anwar’s imprisonment affected your party (PKR)? No doubt we were affected because we lost the leader of our party. However, Anwar also saw this coming, and he actually groomed a few leaders to take over as collective leadership. And his wife, Wan Azizah Wan Ismail, has been our party president for 15 years and has steered the party. So there is no question of a leadership crisis. Do you think Anwar’s absence will exacerbate differences and perhaps even result in the disintegration of Malaysia’s opposition alliance (Pakatan Rakyat)? I’m not going to paint a rosy picture about Pakatan: there are challenges, and I need to be truthful about this. Because of Anwar’s imprisonment, Pakatan has a lot of challenges, including resolving contradictions especially between PAS and DAP [Pan-Malaysian Islamic Party and the Democratic Action Party, which are the two other parties in the opposition coalition]. However, I think Pakatan will survive because of deep rooted operation among the grassroots as well as second line leadership. We know that Pakatan is the single biggest success story of the opposition in Malaysia, and it won 52 percent of the vote in a very oppressive and unfair election. So I think everyone knows that the survival of Pakatan is crucial, and they are working very hard to maintain that. Some have said Anwar’s imprisonment was an attempt by the government to undermine the opposition which it views as a threat after the inroads it made in the last general election in 2013. If this was indeed the case, do you think they have succeeded in doing so? I think the Najib administration has miscalculated. They just galvanized us and made us stronger and committed to working harder to topple them. Actually Anwar has emerged as a martyr; an icon equivalent to Nelson Mandela who was also a political prisoner. Everyone in Malaysia knows that this is politically motivated, and right-thinking people will know that injustice is happening in Malaysia. I think that justice is very important to the Malay-Muslim population, which also pities Anwar’s wife and our party president Wan Azizah Wan Ismail. So I think the government has a huge challenge to convince the people to believe its narrative. If they don’t handle it correctly, the government will fall because of this huge injustice against Anwar. How do you assess the performance of Najib’s government following the outcome of the country’s last general election in 2013? The government has decided to resort to extremism. Aside from Anwar, they have used the Sedition Act to act against more than 20 people, including opposition members of parliament, cartoonists and ordinary Malaysians who have been criticizing the government. This shows that Najib has decided to ditch his moderate Muslim image. Although he projects himself to be a moderate Muslim, he is in fact an authoritarian figure, and his authoritarian streak has shown. So the international community should not be fooled by the Najib administration’s propaganda campaign; paying media consultants and lobbyists to paint a rosy picture. It is not. The picture is actually one of authoritarianism, disregard of democratic principles, human rights and media freedoms. And this shows an increasingly authoritarian and insecure government which is failing and could be toppled in the next general election. Looking ahead, what is your sense of Malaysia’s future trajectory in the coming years as it seeks to become a high-income country by 2020? On the surface, GDP is growing well at five percent. But income inequality has risen: Malaysia has one of the highest Gini coefficients in Southeast Asia. With respect to its trajectory, I think the government believes it can reach its goal in 2020, but that is largely because of government spending. The government keeps on borrowing and spending to propel crony capitalism, so the cronies make profits but the vast majority of Malaysians are suffering because of things like high inflation and corruption such that they eventually don’t get the benefits of this government spending. 2015 is an important year for Malaysian foreign policy, with Malaysia chairing ASEAN as well as having a non-permanent seat in the United Nations Security Council. What in your view should Malaysia aim to achieve during this year? That’s where the international community must hold Malaysia to a high standard. They cannot let Malaysia have the ASEAN chairmanship and a UNSC seat but get away with oppressive measures like clamping down on the opposition, charging opposition MPs with sedition and jailing Anwar Ibrahim. The world community must hold all countries to a high standard including Malaysia. Malaysia cannot be allowed to have these positions but then be left to do whatever it wants at home. The Malaysian government, for its part, must free Anwar and live up to this standard – including respecting individual freedoms and democracy – if it wants to be fully accepted by the international community. U.S.-Malaysia relations have been growing closer with the signing of a comprehensive partnership last year, but the Obama administration has also expressed concerns about rights. What is your message to Washington as it seeks to balance these considerations? I think the United States must live up to its founding idealism which seeks a free and democratic world. They have to hold Malaysia to a higher standard. They cannot continue to cooperate with the government while condoning its oppressiveness. If the Malaysian people see the U.S. government not walking the talk, then they will lose faith in America. So we want to caution America that they need to continue to walk the talk, and hold the Najib government accountable when it does something wrong.